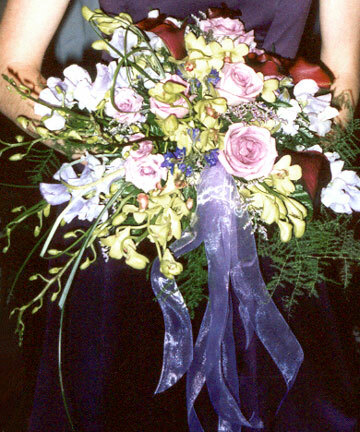 A bridesmaid holds her bouquet of flowers as she precedes the bride down the aisle. Pink roses, dark red calla lilies, and dendrobium orchids are complemented by a sheer, lavender ribbon. What a beautiful mixture of flowers surrounded by feathery, green ferns!